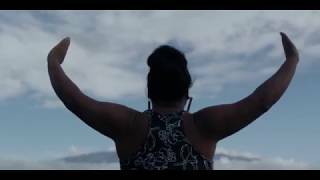 Kaumakaiwa Kanakaole expresses the true meaning of hula from a native Hawaiian perspective on the Island of Hawaii. Kanakaole is a force of nature. She’s won multiple Na Hoku Hanohano Awards, which are Hawaii’s highest musical honor, and has traveled the world performing. Her transcendent voice comes from one of Hawaii’s most esteemed lineages. Her great-grandmother, Edith Kanakaole was a pioneering leader during the Hawaiian Renaissance of the 60’s and 70’s. Her grandmother, Pualani Kanakaole Kanahele is a Ph.D and kumu hula (hula teacher). Her mother, Kekuhi Kanahele-Frias is also a Hoku award winning artist and educator. She calls herself a hula haka, or hula medium – the means in which hula moves through. It’s a way for her to connect to her legacy, and more importantly, to the land. She defines hula as the constant rhythm that nature has. Hula is movement at its most primal. For native Hawaiians, hula is a bridge to authenticity and identity. Kaumakaiwa defines oli (chant) as a vocal or harmonic alchemy. She says it’s the ability to manifest change in your environment. Hula facilitated the connection between her and the land, and reaffirms her commitment as a native Hawaiian. Visit https://www.gohawaii.com/ to discover more about the Hawaiian Islands, experiences, culture, and all your travel planning needs.